Ramon Harvey is a Lecturer in Islamic Studies at Ebrahim College. He has published articles on the history of Qur’anic qirāʾāt and regularly presents at national and international academic conferences. As well as Qur’anic studies, his research interests are in philosophy, theology and early Islamic intellectual history. Dr Harvey received his MA and then PhD in Islamic Studies from SOAS, University of London, specialising in linguistic and thematic interpretation of the Qur’an under the supervision of Professor M. A. S. Abdel Haleem. Alongside his academic training, he has spent a number of years studying with Muslim scholars in the UK, as well as intensive programmes at Al-Azhar in Cairo and the Hijaz. He received his ‘alimiyya from Al-Salam Institute in London after examination by Shaykh Akram Nadwi. He has previously worked as a Senior Teaching Fellow at SOAS, lecturing in Qur’an and Hadith, and as a Research Fellow at the Cambridge Muslim College. He has published on the history of Qur’anic qira’at and is completing his first book entitled The Qur’an and the Just Society with Edinburgh University Press. His current research interests are Qur’anic hermeneutics, Maturidi theology and legal theory, contemporary ethical theory and political philosophy. What is justice ? How can it be realised within society ? These are universal concerns and are central to the primary scripture of Islam, the Qur’an. Utilising a pioneering theological and hermeneutic framework adapted from both classical Muslim literature and contemporary academic studies of the Qur’an, Ramon Harvey explores the underlying principles of its system of social justice. Dividing his book into four parts, he covers Qur’anic Ethics, Political Justice (politics, peace, war), Distributive Justice (fair trade, alms, marriage, inheritance) and Corrective Justice (public and private crimes). 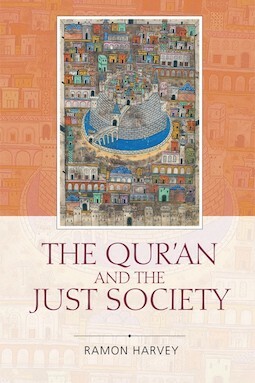 His reading of the Qur’an reconstructs the text as normatively engaging these spheres of justice in their socio-historical context and lays the foundations for future contemporary articulations of Qur’anic ethics. Ramon Harvey is a Lecturer in Islamic Studies at Ebrahim College. He has published articles on the history of Qur’anic qira’at and regularly presents at national and international academic conferences. As well as Qur’anic studies, his research interests are in philosophy, theology and early Islamic intellectual history.